You wish to find a student apartment in Tours without the stress of the move? Study’O is here for you! With its 127 student apartments in Tours, from 19 m² studios to 35.5 m² one bedroom apartments, you will find your happiness, no doubt about it! Our Study’O residence in Tours is ideally located in front of the University campus of Grand-Mont, Faculty of Sciences, nearby shops and public transport. All our student apartments in Tourshave an equipped kitchenette, a sofa bed (140 * 190 cm), desk, a bathroom with shower and toilet, and a broadband Internet connection. The reception of our Study’O residence in TourS is open from Monday to Thursday from 8:30 AM to 1:30 PM and from 3:00 to 6:00 PM and on Friday from 8:30 AM to 1:30 PM and from 3:00 to 5:00 PM. Our dedicated team in this residence will offer a range of à la carte services (laundry self-service, housekeeping, linen rental, parking, etc. 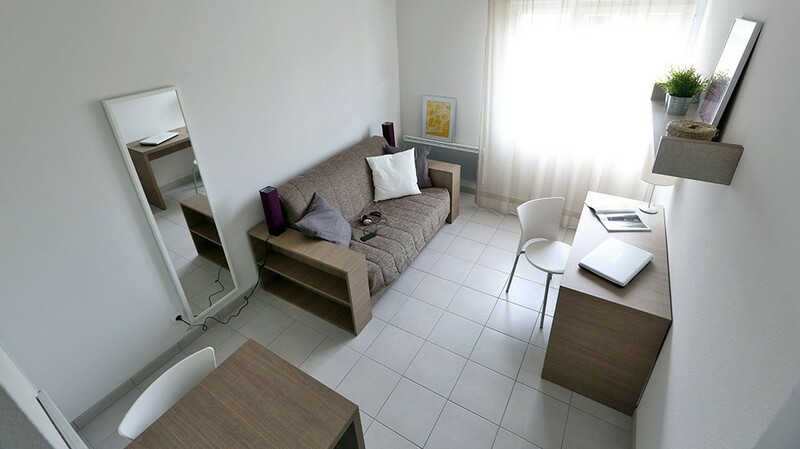 ), at your disposal to make your life in your new student apartment in Tours easier. A turnkey student apartment in Tours without the relocation worries? Yes, with Study’O Tours.